I would bet that when most people think of board games, the circus is not exactly the first image that pops to mind. Artipia Games is setting out to change that with their upcoming fall release, Drum Roll. After watching the progression of game design and art direction on BoardGameGeek for several months, I felt that it was time to have a chat with game co-designer Konstantinos Kokkinis and find out the big deal under the big top. Just to give us all a better understanding of Drum Roll, can you provide a brief summary of gameplay and key mechanics? During the game, the players give 3 shows. For each of these shows they have 5-7 turns of preparation. Each turn has two phases: The action phase and the distribution phase. During the action phase, each player can performer 3 actions. The available actions are acquiring resource represented by colored cubes, selling tickets to increase their income, making investments, and, of course, hiring performer and personnel to equip their circus. For each of the 9 available actions, there are specific limitations on how many players can perform them per turn, as well as how many times they can be performed per turn. For example, the 5 actions that give players resources have a limit of one player and one market per action. This increases interactivity because players can block the resources that others need. After each player has chosen their actions, they perform them in a first-in-first-out priority. They receive resources, coins, buy investment cards, and hire performers and personnel. Whenever players acquire resources they keep them in the cube storage area on their own player board. Then in the distribution phase each player may place up to two resources from their cube storage area, onto their performers. A new turn begins after that. Each performer needs 3 resources to achieve the maximum level of performance and offer their owner the maximum benefit. They can be provided with less than 3, but their performance will not be that good and their owner will receive a reduced benefit. After 5 preparation turns are played, players vote if they want to delay the show and do some more preparation or if they want to start their show. The majority will decide that. This can extend the preparation by up to two more turns. When the 7th turn ends, or when the majority votes to begin, the show starts. This is a scoring phase where players decide the order in which their performers will appear. This allows them to control the order in which they will receive benefits from each performer. Performers who did an outstanding performance can also (once per game) get flipped, and the player receives prestige points instead of the regular performer’s benefit. After all benefits and/or prestige points have been received, players need to pay salaries to all members in their circus. For each coin a player cannot pay, they lose 1 prestige point. After all salaries have been paid, the 1st show is over and players begin the preparation of the next show. 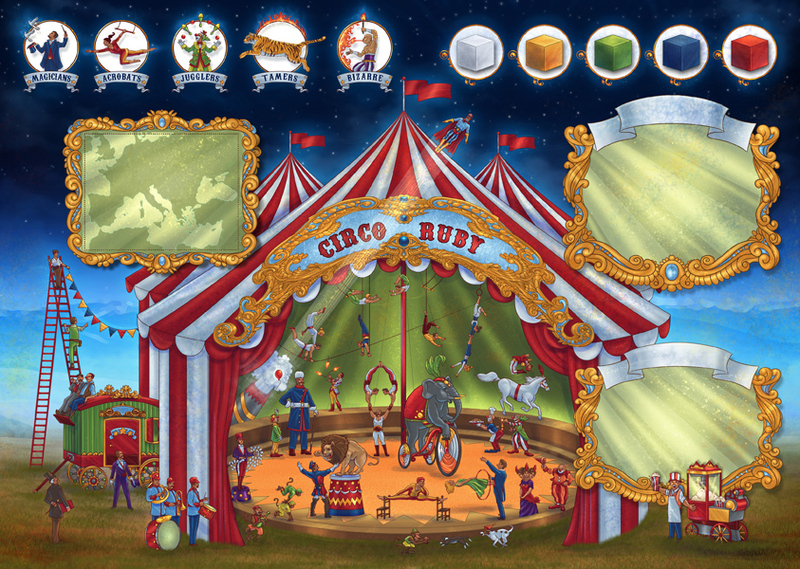 All players retain their circus members and continue to improve the circus. After 3 shows the player who owns the most prestigious circus is the winner. 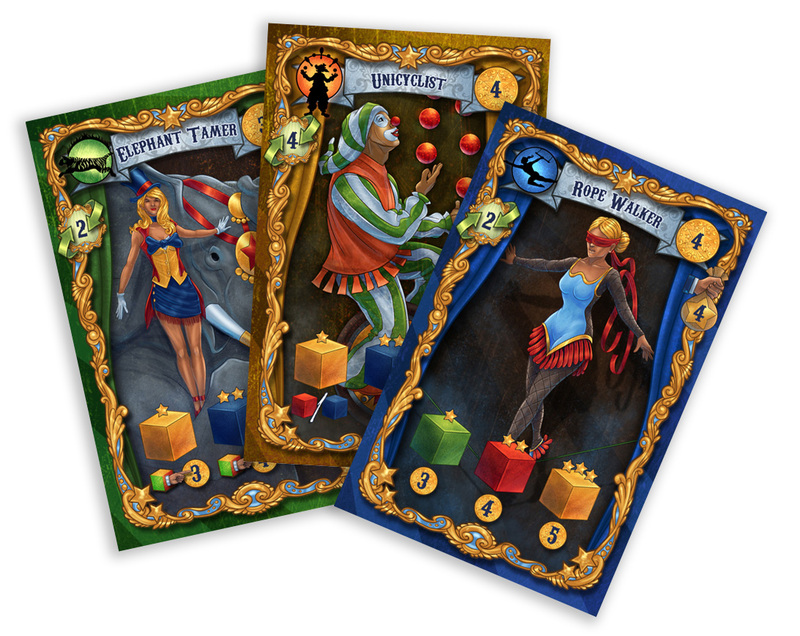 The circus is a great, mostly-unexplored theme in boardgaming. What inspired the idea of Drum Roll? Has it always been about the circus, or did the game come from another idea and evolve over time? The circus always excited me and I was thinking that the market was really missing the circus theme. This is how I invited my co-designer Dimitris Drakopoulos to join me in the creation of Drum Roll. All the game’s mechanics were developed after we settled on the theme and we tried to have all our mechanics represent things and situations that would take place in an actual circus in the early 1900s. How long has Drum Roll in been in production? We have been developing Drum Roll since September of 2010. We spent a lot of time on development because we wanted to have it in a good shape for the BoardGameGeek Greek Guild’s annual contest. Drum Roll was awarded a Judge’s and Public’s Award in the Greek Guild’s 2nd Boardgame Design Contest. Can you tell us more about that contest? How many challengers did Drum Roll face? Initially eight games competed in the contest but two of them dropped out because they weren’t ready. The remaining six were presented to a jury and to the public in different dates. Competition was high, but both jury and public choosing Drum Roll to be the winner of the contest. I believe that having the most complete package (game play, illustration, components, etc.) gave us the first place. Since the contest, the game has been further improved, and much balancing and playtesting has been done. When can we expect Drum Roll to be released? Drum Roll is scheduled to be published mainly through my personal publishing company, Artipia Games. We are communicating with a few other companies which will join in as co-publishers and distributors for their own countries. 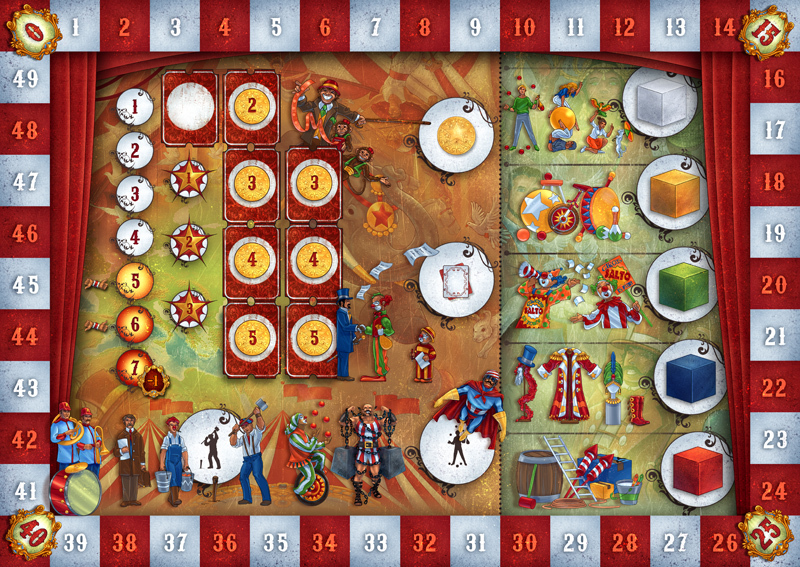 Drum Roll will be released at Spiel 2011 this October in Essen, Germany. Pre-orders will be available from the 1st of September 2011 through our website. Will you publish and distribute directly to the US, or do you plan to work with another publisher to bring the game here? The art is fantastic – very colorful and eye-catching. It suits the theme well, and creates a great atmosphere. How did you get together with artist Antonis Papantoniou? Antonis Papantoniou is a very gifted artist who I had the honnor of knowing for around 12 years. When we started working on the game, I presented the project to him and he agreed to do all the artwork. He started woking on it early in the game’s design in order to have it ready for the contest. What are some of your favorite games, both past and present? 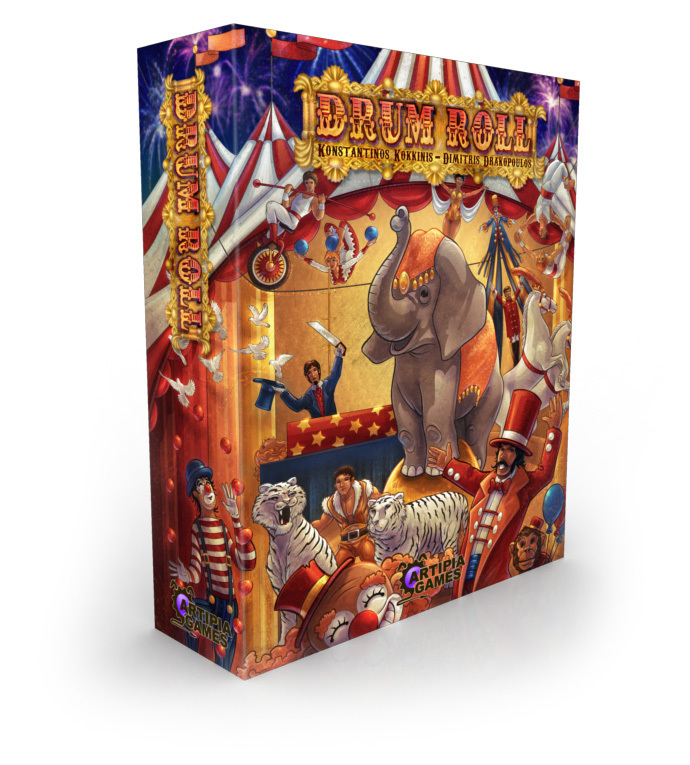 What games do you think directly influenced the development of Drum Roll? Some of my favorite games are Stone Age, Notre Dame, Le Havre, Container and China Town. 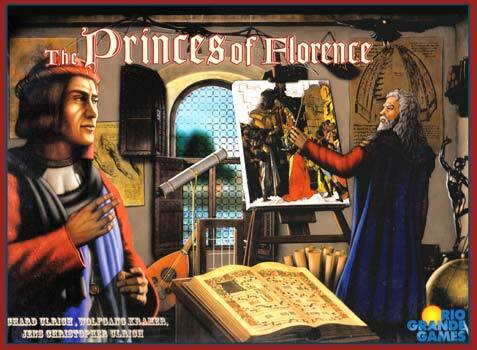 We didn’t really have some direct influence for Drum Roll, but you could say that some of its atmosphere could remind you of Princes of Florence, which is another game I really like. The way performers have specific requirements in order to give the best performance seems to be similar to the way builders and artists have specific requirements in order to do the best works in Princes of Florence. Does Artipia Games have other games in development now? In fact we do. Our goal is to develop and publish two more games in 2012. The first one is a game by Vangelis Bagiartakis (designer of Souvlaki Wars) and the second is a Medieval worker placement game which is currently being designed by me and my wife. Both games will be illustrated by Antonis Papantoniou. Do you have any advice or tips that you can provide aspiring game designers in getting their games published? In order to get a game published, patience and persistence is needed. I believe the first step for every designer should be having absolutely no doubt about their game and theme. We cannot expect others to like something we create, if we are not certain that we like it ourselves. After that, designers should seek out publishing companies and try to show their creation to as many of them as possible. It is of course best to focus on publishers who make games of the same family and target group. Although Artipia Games is just a small publisher, we are always interested in looking at new creations for our future publications, so new designers should make sure to include us in their contacts. You read it here first, everybody – go forth and submit to Artipia Games! 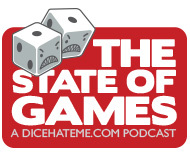 And keep watching Dice Hate Me for more news on Drum Roll and other independent publishing goodies. Hmm..Looks like it could be a ZMAN published game….hmm…let the rumor mills spill over now…. Very interesting. I don’t know if I’ve seen a voting mechanic like that determining something as important as when the round scores. I’ll be interested to see if it winds up being sweet or really frustrating (or both)! Shawn – I will let the rumor mills continue to spin. I can’t give up my secret! I, too, love the circus. It’s certainly a colorful game. Josh – Yeah, it should be interesting to try out. It has some unique twists on old mechanics that seem intriguing. As a fire performer/hula hooper/juggler enthusiast, I’ve been looking for a circus-themed EuroGame to play with my skilltoy friends. Definitely interested in picking this one up, and hoping its cube-pushing is worthy of its excellent theme. i heard pre-orders may get some special exclusive performer cards. Will that apply to the US release, or do I have to buy direct from the European publisher for those bonuses?